In the preceding post, I offered my definition of recession and asked whether the current one has ended. (The answer: not yet, but I may know soon — or sooner than the official score-keepers at the National Bureau of Economic Research.) It since occurred that to focus on the current recession — or any recession — is to ignore America’s mega-depression, which is now more than a century old. 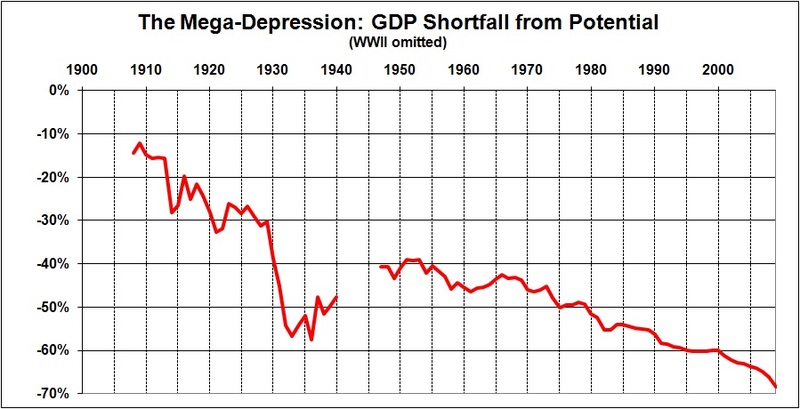 As I explain here, the mega-depression began in the early 1900s, when the economy began to sag under the weight of “progressivism” (e.g., trust-busting, regulation, the income tax, the Fed). 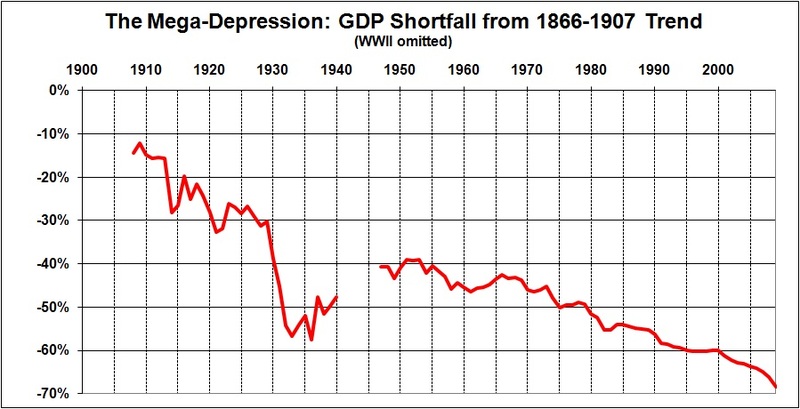 Then came the New Deal, whose interventions provoked and prolonged the Great Depression (see, for example, this, and this). From the New Deal and the Great Society arose the massive anti-market/initiative-draining/dependency-promoting schemes known as Social Security, Medicare, and Medicaid. The extension and expansion of those and other intrusive government programs has continued unto the present day (e.g., Obamacare), with the result that our lives and livelihoods are hemmed in by mountains of regulatory restrictions. Have you ever chanced to hear it said “There is no better investment than taxes. Only see what a number of families it maintains, and consider how it reacts on industry; it is an inexhaustible stream, it is life itself.” . . .